Woe! It’s Wednesday: Do you NaNo? I’m deep in the throes of NaNoWriMo. For those non-writers out there, that stands for National Novel Writing Month. It happens every November. Writers join NaNoWriMo for accountability and fellowship. They each vow to write 50,000 words in the month of November. That’s an average of 1,667 words a day. Not impossible at all. At the end of the month, you should end up with a short, rough, dirty, ugly first draft of a novel. I’ve attempted NaNo five times in the past and completed it four times. I then spend the better part of the next year rewriting and polishing that ugly thing into something a bit more presentable and suitable for public viewing. One of the benefits of NaNo is that it gets you in the habit of writing every day. Or on the days you skip, you’re still thinking about your story and letting it percolate, so when you sit down to do twice as many words the next day, they should flow. In theory. Typically I start strong, right on track for the first week. The middle two weeks are hit and miss. I’m usually seriously behind by at least 15,000 words coming into the final week. Then I put my head down and my fingers on the keyboard and type until the I hit 50,000, usually around 10 PM on November 30th. In the weeks before November 1, forums and blogs and the Twitterverse are full of people talking about the outlines they’re making, the character sketches they’re completing and how they’re sharpening their pencils in anticipation of NaNo. I, on the other hand, open a new document on November 1 and start writing the story that’s been brewing in my head for the last couple of months. I’m writing this post before Wednesday. It’s actually still November 1. I wrote 1802 words today. Writers love NaNo because it gets us back on track if we’ve strayed from a disciplined writing schedule. I love this quote from Nora Roberts: “You don’t find time to write. You make time to write.” NaNo helps me make time to write. I don’t have publisher deadlines or other exterior motivation. It has to come from within. My critique group is one exterior motivation I rely on. NaNo is the other. Stud Muffin: … um … the first day of the rest of my life? SM: … um … November 1st? Me: Yes. And November 1st is …? Me: The first day of … NaNoWriMo! Yes, it’s November. That means Veterans Day, Thanksgiving (in the US) and NaNoWriMo. It’s a good month. 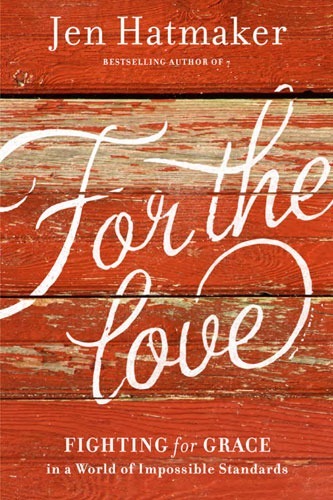 My last Book Talk Tuesday post I mentioned that I was in the middle of Jen Hatmaker’s latest, For the Love. I’ve finished it and it’s on my desk waiting to be delivered to a friend who wants to read it. It’s great. It’s full of Jen’s trademark humor and transparency. She’s all about urging us (women, in particular) to give ourselves (and each other) some grace. Your kids may say, “Give me a break.” Your husband may ask for a free pass for forgetting to pick up something on the way home. But they all mean the same thing: Give me some grace. Don’t make me meet some unrealistic standard set by our post-modern culture. The chapters alternate randomly between pure hilarity and serious lessons, and even a few recipes that I’m dying to try. In some ways, I equate For the Grace with Anne Lamott’s essays urging us to let go of the things in our head that tell us how we should be and just go fetch water for someone thirsty. Because if you’re too worried about what someone will think of your thighs or your lipstick color, you need some grace. And if you’re looking at someone else’s underarm fat or hem length, you really need some grace. For the Love would be a great place to find some everyday grace. I highly recommend it. Media Monday: Final Just Fab post! 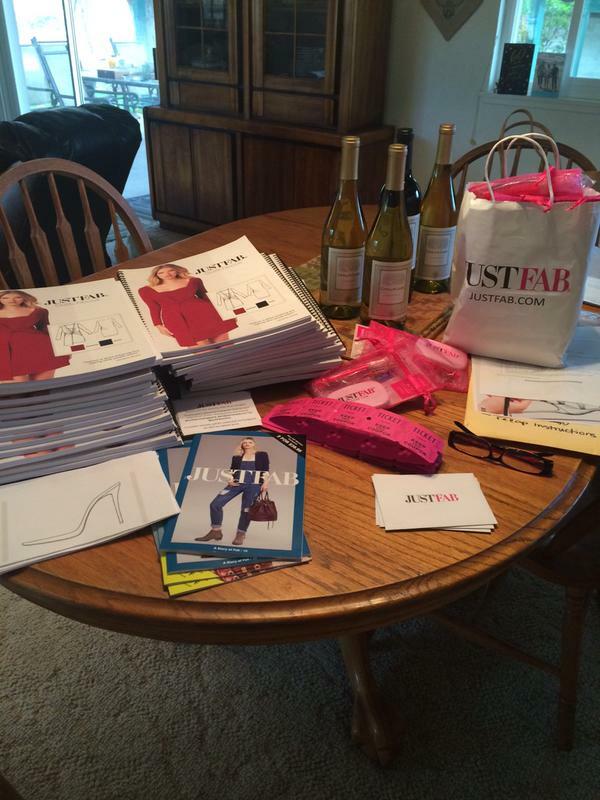 Well, it’s been a month since my Project Runway viewing party sponsored by JustFab and about three weeks since my products arrived for me to use and evaluate. I think it’s safe to say both are a hit. About a week later, my first products arrived. 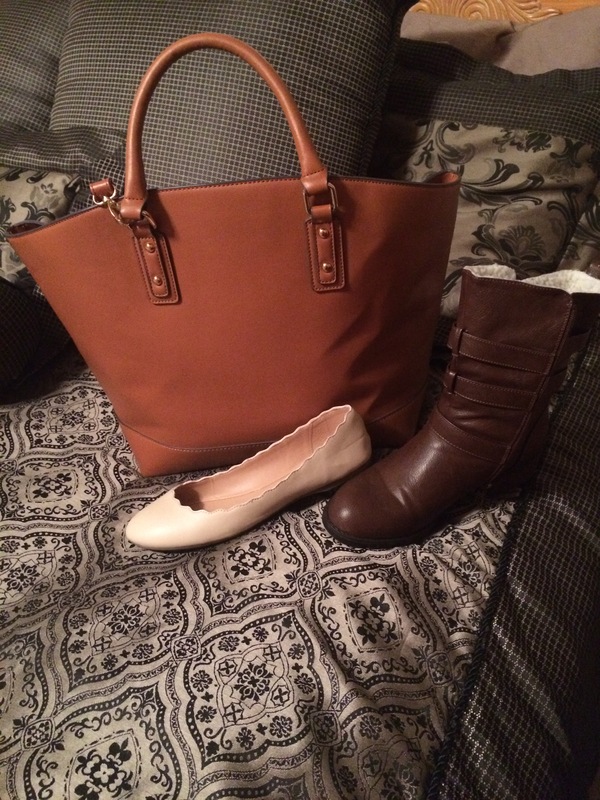 A purse and a pair of boots. I had also ordered a necklace and it was listed on the packing slip but it wasn’t in the box. It must have slipped through the cracks somewhere. But since these products were pretty much free (I did purchase a product at a discount offered to first time users of the website), I didn’t complain or request a new one. I may still order it in the future. A few days later, my last product arrives, a pair of flats. I’ve worn the flats and the boots a couple of times each and I’ve been carrying the purse for about three weeks now. I was surprised at how well the shoes fit. Both the flats and the boots. I have a hard enough time finding shoes that fit when I go to a store and try them on, that I really didn’t expect mail order shoes to work the first time out of the box. But they did. They’re both very comfortable with minimal “break in” time. They felt good the first time I put them on. The bag is big. Bigger than I usually carry. But I love the shape and the color. The quality of the leather and the hardware seems to be fine. Both are holding up to my everyday wear and tear without a problem. So I’ve been a JustFab member for a little over a month now. I skipped a purchase in October since I had just ordered these at the end of September. I’m ready to try another product in November. Probably something from the jewelry line this time. Stay posted for a review of that in a month or so.